A historic new baseball and softball venue -- the first-ever national home and training centre of Ghana Baseball and Softball -- has been presented to the Ghana Baseball and Softball Association (GHABSA) by the Embassy of Japan in Ghana in the capital city of Accra. The new national home of GHABSA has been named "Koshien Ghana Japan Baseball and Softball Field", deriving its name from one of the most legendary sports venues in all of Japan: Nippon Professional Baseball's Koshien Stadium. The Embassy of Japan in Ghana fully backed the construction of GHABSA'S new home with a grant of US$ 123,453 -- citing objectives such as strengthening the cultural ties between Ghana and Japan, raising national interest in baseball and softball to activate the youth of Ghana through sport and developing competitive National Teams to aspire to participate on the world's most important sports stage, the Olympic Games. The new Koshien Field will serve as the historic first-ever national training facility for the development of GHABSA's ambitious National Teams Programme (the "Rising Stars"), which can now form a strategic-plan to eventually host sanctioned continental competitions, especially among West African countries, and qualify to represent Africa in international competitions. Riccardo Fraccari and Don Porter, WBSC co-Presidents -- who recently announced the inaugural WBSC Congress would be held in the North African country of Tunisia next month --hailed Africa's growing prominence and string of landmark breakthroughs as a major boost to the universality and global spread of baseball and softball. "This is truly a historic day -- one that sends a strong signal about baseball and softball's universal appeal, growth projection and penetration into new and emerging territories," said WBSC co-Presidents Riccardo Fraccari and Don Porter. "The continued emergence of Africa is, and will continue to be, central to baseball and softball's evolution and global positioning." Ghana joins Central African country Uganda, along with the United Kingdom and Sri Lanka, as the most recent countries to enter into a new and global era by introducing historic national baseball/softball venues in their respective countries. Both Uganda and Sri Lanka's first-ever baseball/softball facilities were also constructed under the patronage of the Embassy of Japan in the said countries. The official ribbon cutting ceremony of Koshien Field was attended by the Ambassador of Japan to Ghana, H.E. Mr. Naoto Nikai, Ghana's Minister of Youth and Sport, Hon. Elvis Afriyie Ankrah and GHABSA President Albert Frimpong. 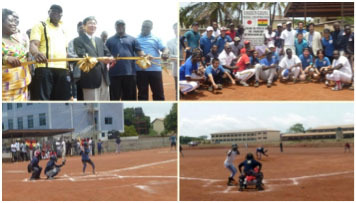 Japanese Embassy officials, in cooperation with GHABSA and national sport authorities, have been promoting baseball and softball in Ghana since 1997, with the aim of sharing in a strengthened "cultural exchange" between Ghana and Japan, and both Embassy and GHABSA officials have cited statistics showing sustained increases in the number of participation in baseball and softball among schools and club teams. "We are proud and grateful that the Embassy of Japan in Ghana finds great value in baseball and softball as a global vehicle to serve both sport and society," said Fraccari and Porter, "and we are particularly proud of the Ghana Baseball and Softball Association, under President Frimpong, for the resilient efforts in successfully coordinating this historic project to give baseball and softball players -- and future generations -- in Ghana a true home." In additional to the grand opening of Koshien Ghana Japan Baseball and Softball Field, GHABSA officials indicated that there are plans to partner with the Embassy of Japan to send Ghana's best young baseball and softball "Rising Stars" athletes to Japan for elite training. The Ghana Baseball and Softball Association was founded in 1992 -- the same year baseball was introduced as an Olympic sport in Barcelona -- and is a member of the Africa Baseball and Softball Association at the continental level and the World Baseball Softball Confederation at the world level.